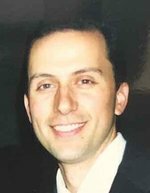 JOSEPH W. ZIZWAREK, 50, beloved son of Joseph and Ida Zizwarek, of Bordentown, NJ, passed away on Saturday, August, 25, 2018. He was born in Neptune, NJ, and resided in Ewing, NJ, and recently settled in Bordentown, NJ. Joseph was a graduate of Jackson Memorial High School, Jackson Twp., NJ, and The College of New Jersey, Ewing, NJ, with a BA in criminal justice. He later graduated the Middlesex County Police Academy. Joseph was a Police Officer for the Montgomery Twp., Police Department, Belle Mead, NJ and was preparing to retire in February of 2019. He was previously employed with the New Jersey Transit Police Department from 1994-1998. He was a member of Calvary Chapel, Ewing, NJ, and PBA #355. Joseph is survived by his wife, Natasha Zizwarek; his sons, Logan Zizwarek and Nicholas Zizwarek; his daughter, Madeline Zizwarek; his parents, Joseph and Ida Zizwarek; his sisters, Gina Di Iorio and her husband, Sam, and Michelle Wells and her husband, Maury; his nieces, Angela Parise, Miranda Wells, Moriah Wells, and Miriel Wells; his nephew, Mason Wells and by his great nephew, Douglas B. Parise-Zahn. Relatives and friends are respectfully invited to attend his visitation from 2-4 & 6-8 PM on Sunday, September 2, 2018, at the GEORGE S. HASSLER FUNERAL HOME, 980 Bennetts Mills Rd., Jackson Twp., NJ 08527. A private cremation will follow. In lieu of flowers, contributions may be made in Joseph’s memory to America’s Keswick, 601 Route 530, Whiting, NJ 08759 www.americaskeswick.org and would be greatly appreciated. For directions, further information, and to send condolence messages to the family, please select a tab on the left.